ATA Molded PE Pop-Up Console Rack; 12U Top, 10U Bottom with Casters. 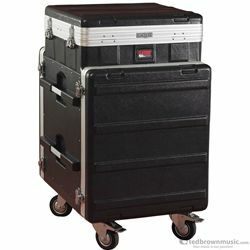 Mobile audio 19" concole rack with pop-up top-loaded rack with high density polyethylene construction. Top rack uses a pop-up ratchet system for transporting flat elevating to various angles. Threaded rack rail. Side handles for easy lifting to stage or truck and 4" heavy-duty industrial caster, two of them are locking.